Amy Sedaris' vanilla cupcake recipe REVEALED! 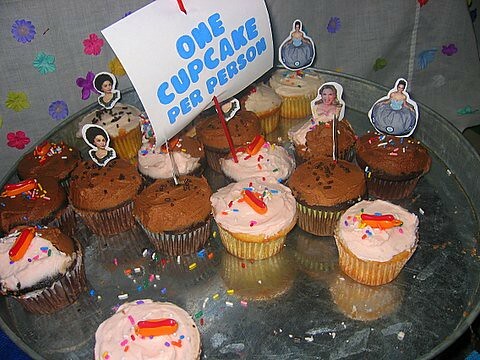 Amy Sedaris' cupcakes, originally uploaded by candiedyams. From Chris Hewitt's St. Paul Pioneer Press article about Amy Sedaris, we get this recipe for her vanilla cupcakes. So if you don't live in NYC (or if like me, you still have never managed to get your hands on one of her cupcakes) now you can make some Amy Sedaris cupcakes yourself! Oh, and to make them truly authentic, be sure to decorate them with a plastic ballerina or some other little plastic toy. To prepare oven, muffin tin: Preheat over to 375 degrees. Adjust oven rack to middle position. Line standard muffin tin with paper or foil liners. To make cupcakes: In large bowl, cream together butter and sugar. Beat in eggs, vanilla, salt and baking powder. Add flour in 3 batches, alternating with milk. Beat at low speed for 30 seconds or until mixture is smooth and satiny. To bake cupcakes: Divide batter evenly among cups. Bake for 18 to 20 minutes or until tops are pale gold and toothpick or skewer inserted into center comes out clean. Cool on wire rack for 45 minutes or until at room temperature. Shopper's note: Look for double-strength vanilla at Penzeys Spices, 674 Grand Ave., St. Paul, or order it online from such Web sites as www.watkinsonline.com. In medium bowl, whisk together confectioners' sugar, half-and-half and vanilla until smooth and fluffy. what is half and half on the recipe? is that semi skimmed milk? how funny ... everyone's doing amy sedaris stories, but digging for the unique angle. the happy ending here is seeing that her cupcake recipe made it here, to its ideal destination! This is what half-and-half is. the yield on this is actually 2 dozen and the frosting does require some butter. Am I missing something? The recipe said that it made 1 dozen. I doubled the recipe, expecting it to make 2 dozen. Instead, I got 48 cupcakes! Unless you use extra large muffin tins (if so, specifically state), please adjust the number that the recipe makes. me too! I got two dozen! and I only wanted one dozen! oh well! thanks for the recipe! Just made these for my son's first birthday. I haven't iced them yet, but I'm already in love. Very light and fluffy with a subtle, yummy flavor. Will definitely make again! I thought that the taste was very good and light and the cupcakes' texture was light and airy. "Very fluffy," said my husband. I usually make cupcakes that are more like pound cake using The Cake Mix Doctor's recipes. 375 was way too hot for these cupcakes in my oven and when it's 108 outside. I pulled them out 4 mins before they were due and they were almost too far done but yet had pits in the middle. I think it was a defect of my oven. Then I had enough batter for a pan of mini-cupcakes. They spread out all over the top of the pan and were almost inedible. The part that hit the pan were crispy and buttery but I couldn't pry them off to get to the body of the cupcake, which was only one bite anyway. I do not recommend this for mini-cupcakes. I think they might work best with a silicone cupcake pan. I'll try that next time. They didn't want to release from their cupcake liners and when they did, they cracked. These would be a nightmare for stacking or for a party when a pound cake-like recipe can hold up to heat, handling and loads of frosting. But these would be nice for a tea or when looks aren't exactly necessary. It was very easy to make and the first time I've made homemade cupcakes (and I'm known as the Cupcake Lady) in a long time and been glad I did. Hi! I'm so happy I found you. My cupcakes are separating from the wrappers. My girlfriend and I are stumped. I live in SW Florida and it is humid, but my home has A/C and is very cool. Any tips?